Can you believe this is my first cocktail recipe? What? I know, me either. One of my favorite all-time cocktails is a mojito, but it’s really hard to find a great one. The best one I’ve had so far is at the Banana Cafe in Washington, D.C. B.O.B. Bob and I have gone out of our way to go there just for the drinks alone, although their food is almost as amazing. If you visit, order a pitcher of mojitos, instead of ordering by the glass. I know the price seems extremely steep, but you’ll drink the whole pitcher before you know it, and you’ll most likely decide to order another one after the first, because their mojitos are just that freaking amazing! I decided to make a pineapple version of the classic rum cocktail, after seeing Jelly Toast’s Pineapple Mojito recipe. I couldn’t stop thinking of this drink the entire day, and headed straight to the market after work to pick up pineapple, limes, and club soda. I just had to have it right away. I’m not going to say this is the best mojito I’ve ever had, because it’s not. B.O.B. Bob and I spent about a half an hour in the kitchen adding a little more pineapple, a little more mint, a lot more sugar, and of course a lot more rum, because if you’re going to have a cocktail you want to taste the alcohol in it. After all of the tweaking, we finally had something worth drinking, but I’m still ready for a trip to D.C. to indulge in the real thing. Place pineapple, mint leaves, limejuice, sugar, and salt in a food processor, and then puree until smooth. 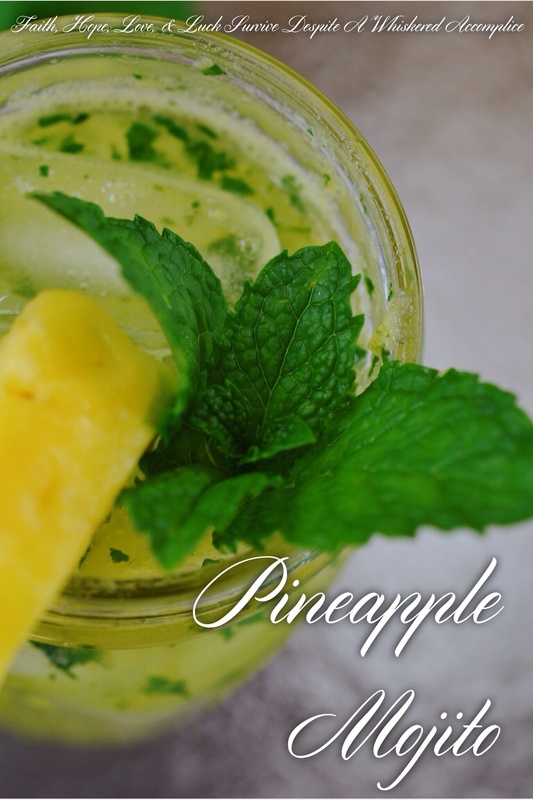 Place 4-tablespoons of the pineapple and mint mixture in a large decorative glass. Add 3-tablespoons of rum to the glass; mix well. Throw some ice into the glass, and then slowly pour 1-cup of club soda over it. 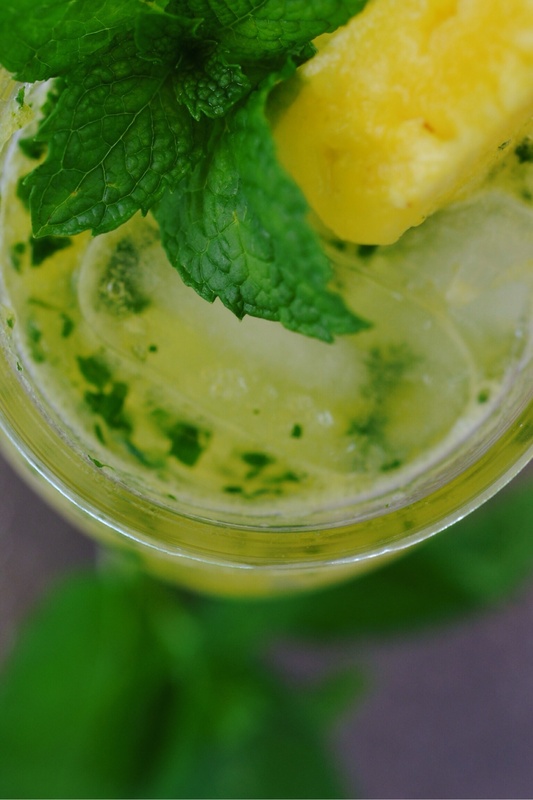 Mix the drink with a long spoon, and then garnish with several mint leaves and a slice of pineapple. You may need to add more sugar if your pineapple is not overly ripe. 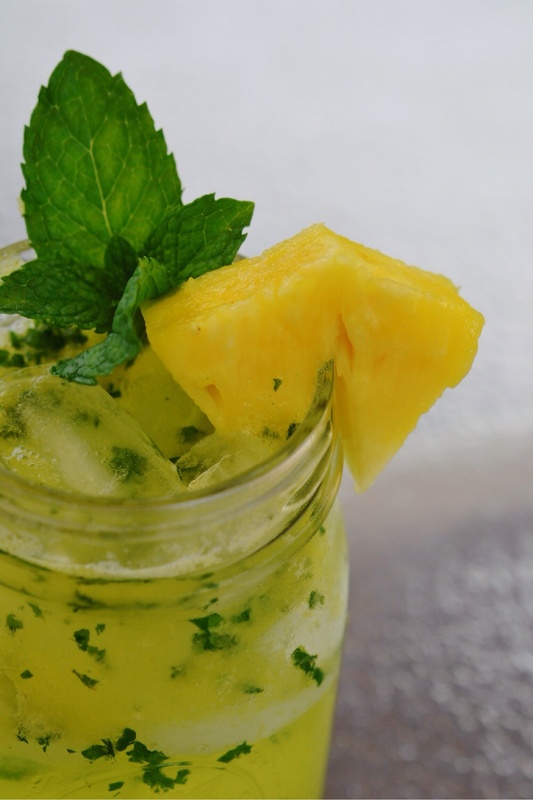 Save any leftover pineapple and mint syrup in an airtight glass container, or freeze the mixture in ice cube trays to use later on to flavor water. Coat the rim of your glass in sugar. Add a slice or two of lime to the drink, or use as a garnish. You’ll have to make this for me next summer. Linda, when you start drinking again, Bob and I will take you to Banana Cafe for the real deal!